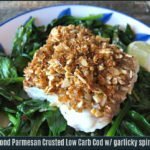 This super easy 25 minute weeknight dinner recipe for Almond Parmesan Crusted Low Carb Cod with garlicky spinach is also gluten free, keto friendly, and extra flavorful! As we slog through a cold and gray January (at least in my neck of the woods here! ), let’s continue on with this month’s theme of easy, low carb, gluten free, keto friendly recipes to help some of you stick to your New Year’s Resolutions. 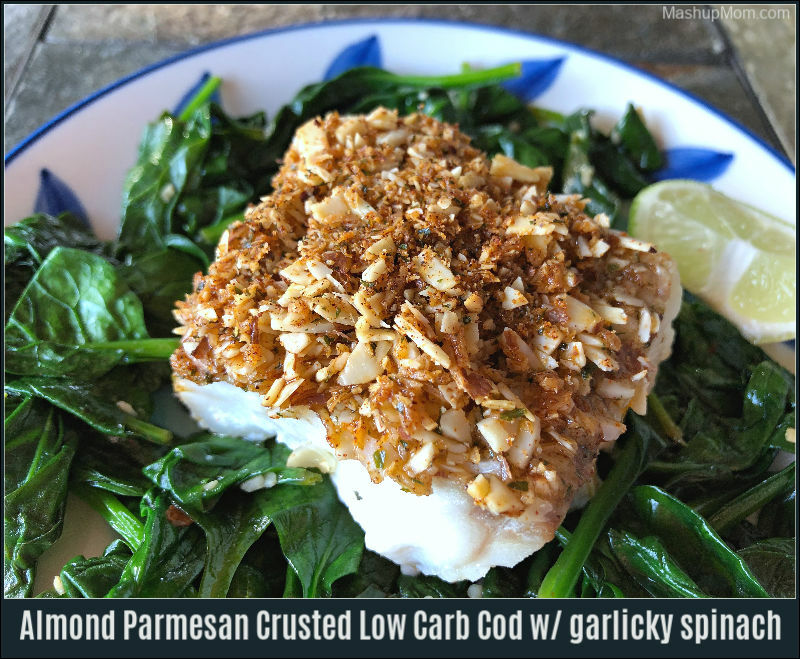 Up today: Almond Parmesan Crusted Low Carb Cod with garlicky spinach, a simple all-in-one 25 minute weeknight dinner recipe. 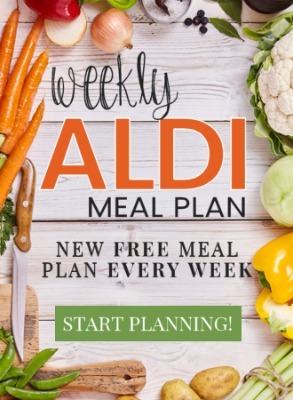 Almond Parmesan crusted cod is an all ALDI recipe, inspired by this week’s sale on frozen wild-caught Alaskan cod. (Two pounds ran me just $8.99 at my store, which is a great price.) 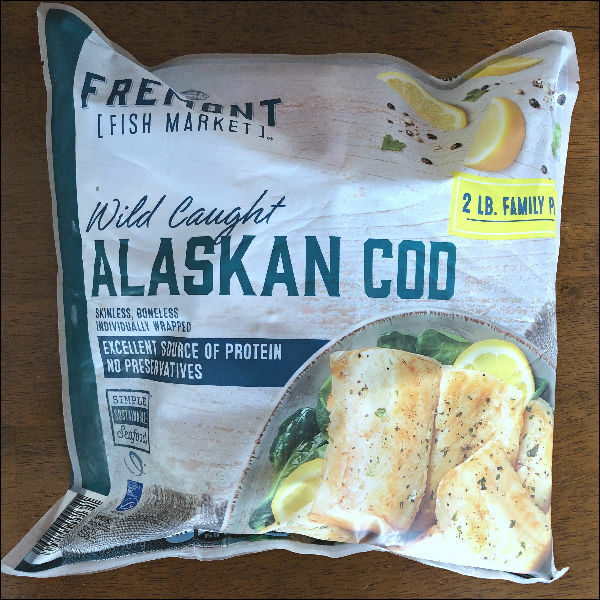 One bag netted us two family dinners — and, the fillets are individually wrapped, so no worries if you have a smaller family and want to open the bag and use them gradually over time. 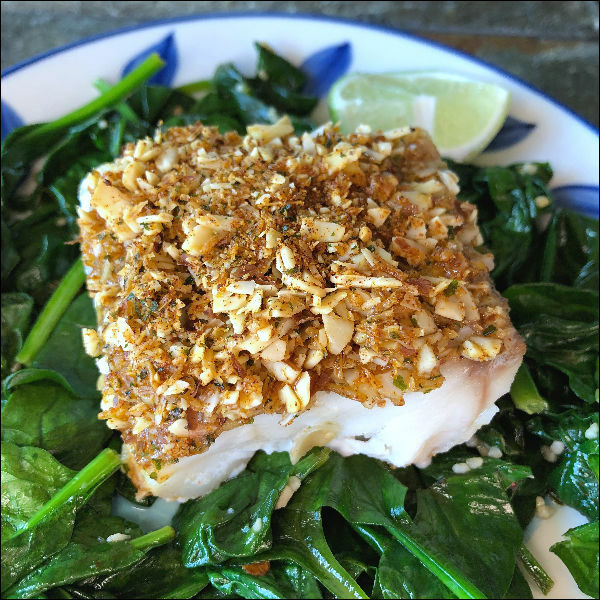 In our house, Middle School Guy was actually the biggest fan of this easy almond crusted cod recipe… although he says he’d prefer his sans spinach. Kids, I tell ya… 🙂 Don’t you listen to him, though, because the spinach really rounds out the complete dinner here and works so well together with the baked cod and its almond Parmesan topping. Thaw cod, if frozen. Preheat oven to 400 degrees, line a rimmed baking sheet with parchment paper, and melt the butter. Place cod on the parchment paper lined baking sheet and brush with butter, then season with salt & pepper. 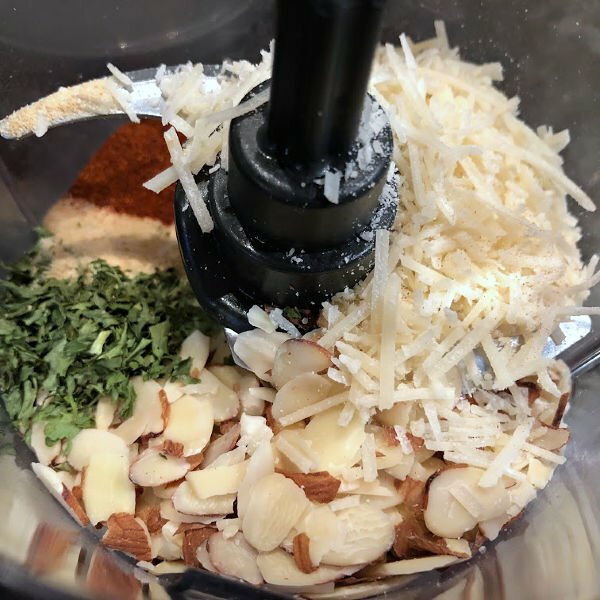 Add almonds, Parmesan, and spices to a small food chopper or food processor. Pulse lightly to coarsely chop, until just crumbled and combined. 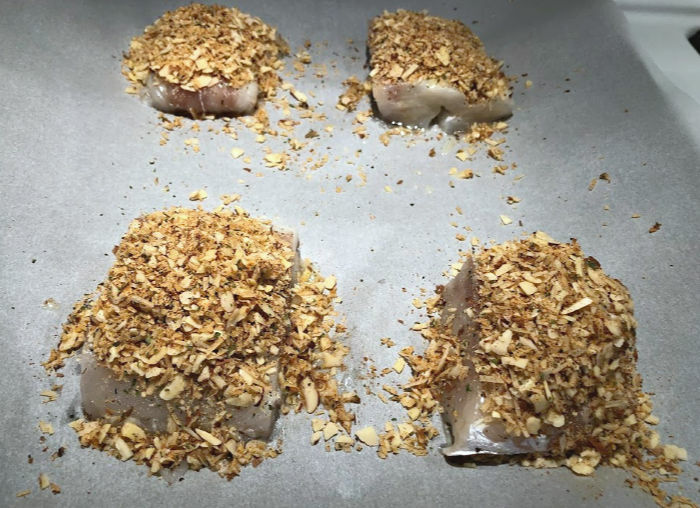 Spread some of crumbled almond Parmesan mixture across the top of each piece of cod, press it in lightly, then add the rest of the almond Parmesan mixture so that each piece of fish is generously topped. Heat olive oil in a large skillet over medium heat for one minute. Add garlic and saute briefly, then add spinach. Season with crushed red pepper, sea salt, and black pepper, then squeeze in a splash of lime juice. Saute over medium heat, stirring often, until spinach is wilted and dark green. Squeeze fresh lime juice over the baked cod, then serve the baked fish over a bed of garlicky sauteed spinach. Use additional lime wedges for garnish, if desired. Note: This recipe makes a lot of topping — but as you eat the cod the topping also adds extra flavor to the spinach, so everything works together here. You can substitute a different firm white fish such as flounder or tilapia, but reduce cooking time if you are using thinner fillets and check for doneness at 10 minutes. Just 25 minutes start to finish for this complete weeknight dinner — and, it’s low carb, gluten free, and keto friendly? What else could you really ask for in one recipe? The almond and Parmesan add lots of flavor to the slightly chewy cod, which pairs with the soft & garlicky spinach for a complementary contrast in both flavor and texture. Be sure to add the fresh lime juice at the end to brighten up all of the flavors, too! Heat olive oil in a large skillet over medium heat for one minute. Add garlic and saute briefly, then add spinach. Season with crushed red pepper, sea salt, and black pepper, then squeeze in a splash of lime juice. This recipe makes a lot of topping -- but as you eat the cod the topping also adds extra flavor to the spinach, so everything works together here. You can substitute a different firm white fish such as flounder or tilapia, but reduce cooking time if you are using thinner fillets and check for doneness at 10 minutes. This recipe sounds delicious. Do you know if the cod is caught and processed in the United States? Thanks! I just looked at the bag. It’s caught in Alaska, but processed in China. Do you know how many carbs to this recipe? It sounds great! Looking for salmon recipes too! I do not, sorry. People often use something like MyFitnessPal to calculate for themselves. Yum! This sounds delicious – I bet the crust adds so much flavour and a lovely texture to the dish. I haven’t tried — it takes so little time to make. I wouldn’t freeze it with the spinach, though, and am not sure how the topping would come out.